I try not to pay much attention to the National Party Progressive Cameron Slater and the bunch of clueless sycophants who make up the Whaleoil blog. However I must admit to being interested in observing just how far to the left he would go in supporting the hapless Nats. One of his latest efforts is an article relating to the Reclaim Australia demonstrations held across that country at the weekend. Just to emphasize how damaged Slater’s political perspectives are, he precedes the article with another where he kisses the red Marxist arse of the Fairfax propagandist ex News of the World writer Andrea Vance. How left wing can the National Party and its supporters get? Very left wing. Slater’s article on Reclaim Australia strangely relates the story of the protest but completely misses the really stand out point. 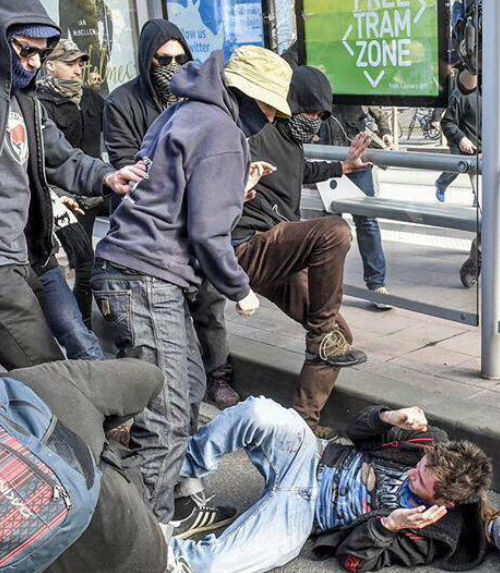 That is that the anarchists, socialists, Marxists and communists using violence to try and quell the voice of Reclaim Australia are on the same side as Slater and the National Party. Slater is using all the standard Marxist tactics to try and quell criticism of National’s policy of encouraging immigration and land / house purchases by visitors, students or immigrants from the People’s Republic of China. He’s lying. He’s smearing. He’s trying to ridicule his critics. With the objective of making the criticism go away. And the anti-reclaim Australia forces are adopting exactly the same strategies in Australia. With exactly the same objective. They want the criticism of mass immigration to be silenced. (They are mainly the organisation called The Socialist Alternative.) They do it mostly by smearing those with opposing ideas as “racists”. Just like Slater does. 1) The reason National supports mass immigration is to fool voters into thinking John Key and his socialist cronyists are doing well on the economic front. Without the GDP boost provided by immigrants, the folly of accepting the socialist baton from Helen Clark would be fully exposed as Keynesian lunacy. Don’t be mistaken for one millisecond on this issue. The Nationals are encouraging immigration only to support otherwise unaffordable socialism. They are in the main blissfully unaware of how they are playing into the hands of the far left. 2) New Zealand’s heritage is English or European. We have a Westminster system of government and have followed English or British traditions and customs in building our country. Those traditions and customs are based on respect for the individual and they grew out of iconic events such as the Magna Carta and the defeat of Nazism during WWII. It is a mix of those social beliefs and religions that built countries that started as English colonies and as such were once the most liberty focused nations on earth. This is what we call our heritage, and today that heritage is under prolonged and determined attack from forces within. 3) The force that attacks and undermines our heritage is the Progressives. Immigration is only one of the strategies they have chosen to use to pull down the old and replace it with the Marxist new. To use left wing language, it is all about deconstructing established power structures and building an “improved” communist power structure. Se we see vile attacks on Conservatives. We see attacks on white people. On men. On the so called rich. On Christians. On marriage. On mothers. On the family. We see massive division in our society, for homogeneity would allow it a strength that would foil the left’s ambitions. All these attacks are designed with one objective in mind- the destruction of our heritage and our traditional social structures. 4) Hence mass immigration. You just have to look at who is behind the violent pro-immigration protests in Australia. Why are self proclaimed and dedicated socialist groups so supportive of immigration? Because it fits in with their plan to deconstruct our traditional society. Every time an immigrant arrives on our shores who has no knowledge of or regard for our heritage and traditions, these things are weakened..!!! Cameron Slater is a Marxist stooge who is never going to get it. He’s just another Progressive who differs from those on the extreme left only by perhaps being like most of the National Party, more stupid. For none of them can see the obvious truth and the plain and simple Marxist plan behind all that is happening. I wonder how long before Andrea Vance becomes a regular contributor to Whaleoil. This is also why history in our schools is so poorly taught and so poorly regarded. The idea is to raise generation after generation who have no knowledge of or regard for what went before them. The idea is to have our children as ignorant of our traditions and heritage as a new immigrant from say Outer Mongolia. That way, its so much easier for the Progressives to pull it all down. Agree entirely trueblue. I would say the same to Slater but I am blocked from his site along with many others. I think Slater’s star is waning considerably and his support is slowly but surely drying up. He’s going to find money harder and harder to come by. His cowardly Chief Censor will either be working for free soon or he will be gone. It is bizarre.In its quest to remain in power, National fall over themselves with policies that fit the progressive model, the marxist quest, and yet are seemingly oblivious to the destruction they are causing and have lost the ability (or maybe don’t have it) to think for themselves. I received an email from a Minister that I know well, about the latest policy announcements and shook my head.That Minister probably never wrote that email but has succumbed to the Party plan and fronts the portfolio like a machine just parroting the dribble and dross like the rest of Cabinet. And the we have so called National supporting blogs like Farrar and Slater’s that may as well support Labour. Thank you John. If its any comfort, I think the movement that rejects the current media/ political progressive power bloc is gathering steam. Its slow, but it is sure, and all it needs is a trigger or to reach a tipping point and it will be all over for these betrayers. A lot quicker than we thought possible. Watch the US for pointers. But why are we wasting oxygen on this oxygen thief. 1. Who is paying Blubberboy for his views. It is well known that he is for sale. 2. By his own admission he is a dirty despicable little cockroach. 3. Whaleshit is heavily censored and filled with troglodytes. Think on them no more.. I always thought Slaters stance (ostensibly anti-racist) reflected backing by the golden goose real estate sector? “For multiculturalism to succeed identities need to be transformed”. One way this is facilitated is beginning a conversation as to what it means to be a Kiwi etc, etc.